The restaurant, which opened a year ago, was born from the desire to “eat well in a beautiful place.” The spacious dining room, with its industrial-high ceilings and huge windows, is accentuated with cowhides and raw wood and illuminated by globe chandeliers — a design choice by Imaad Rahmouni who, I’ve been told, was going for a brown-colored cocoon. 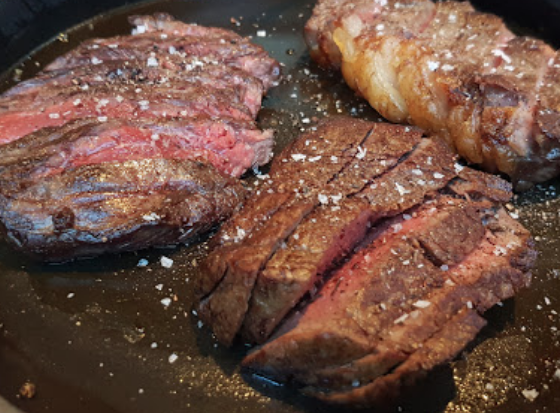 Our charming hostess, Doucelia (her gold-plated name necklace was a helpful reminder), suggested that we try their popular “trilogy of beef,” cuts from matured breeds and regions throughout France such as Limousin, Aubrac, and Simmental. But before we indulged in these melt-in-your-mouth filets, we sampled some elegant-yet-nuanced items that Chef Cyril Aveline prepared for us: a side of ridged pommes frites with garlic hummus, sautéed asparagus, an heirloom tomato-raspberry salad topped with a framboise fraiche (something that needs to be tasted to be believed), and an eggplant-mushroom medley that paired brilliantly with everything. The Monday lunchtime crowd, we noticed, was an eclectic mix of businessmen and casual diners, including a foursome of poshly dressed sextagenerians who seemed to be having a lively conversation about current events and the state of the world — at least, that’s what I imagined had I been fluent in the local language — considering the city was in the grips of a public transportation strike that, luckily, hadn’t affected my visit. In fact, it felt as if the union disputes hadn’t affected any of my experiences on the Metro system, especially as I made my way back to my hotel later that evening. However, upon exiting the Vaugirard station, I was nearly run over by one of the many speeding bicycles that were frequently zipping through traffic. C’est la vie, right? Back downstairs, I found that the cozy lobby lounge came equipped with shelves of alcohol, mixers, and snacks — welcome to the Honesty Bar, a make-your-own-cocktail station built on an honor system. 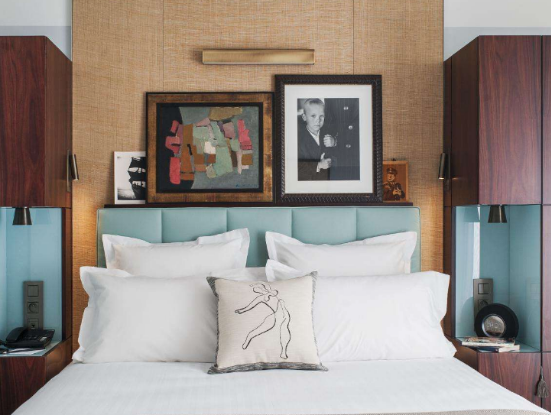 (Guests fill out a sheet noting their room number and what they’ve taken from the mini fridge or shelf.) I opted for plain ginger ale. 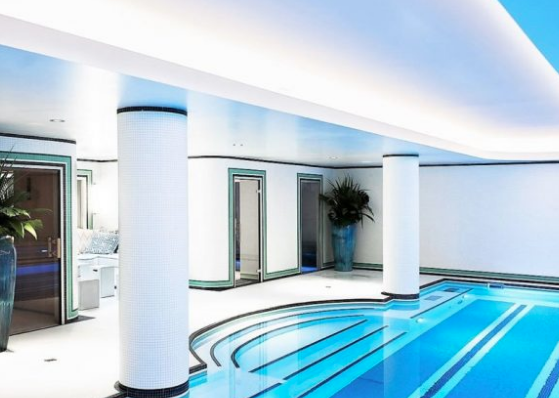 And finally, beyond the Pierre Frey carpets, cozy nooks, and airy terraces lies “the jewel in the hotel’s crown”: Blomet’s pool, hammam, and sauna. Nestled under an inner courtyard, the softly lit dream space is where luxury and relaxation reign, a quiet subterranean getaway that I unfortunately didn’t take advantage of given my busy schedule. I carefully studied the colorful lines on the map of the Paris Metro, and after a few minutes, it wasn’t so difficult to decipher. I just have to take the yellow line heading towards Gare d’Austerlitz, I told myself, and take it to La Motte Picquet Grenelle, where I’ll need to transfer onto the light green line (the 6) heading towards Nation, and then take that to Pasteur, where I’ll take the 12 to Vaugirard… Simple enough, right? Torrential rain and a lightning storm didn’t make it so simple. When I landed in Paris for three-night visit earlier this summer, I didn’t anticipate such a wet welcome. But after spending one cold weekend here as a student abroad 17 years ago (ah, the early aughts), I was ready to reacquaint myself with the city known for its fromage, fashion, and fondness for romance. However, before I could familiarize myself with the intricate Metro system, I opted for a cab once I rolled my luggage outside the terminal at Charles de Gaulle. 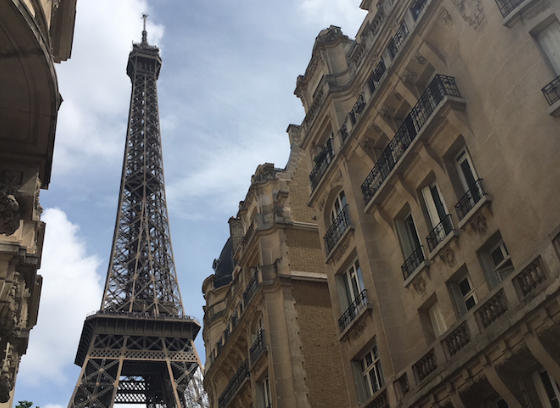 A luxe black Mercedes brought me into Paris’s 7th arrondissement. I was dropped off in the heart of the city’s government district, where I checked into Hotel Bourgogne & Montana(part of Groupe Maurice Hurand), a former 18th-century mansion that is now a boutique property located across from the National Assembly, the lower house of the bicameral Parliament of France. Arriving much later than expected (darn storm delays), I walked into the brightly lit lobby and was immediately greeted by the 24-hour concierge, a smiling woman who was attentive to the exhaustion I was clearly showing on my face. 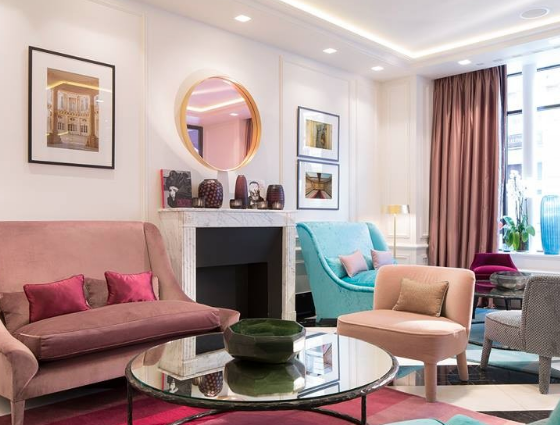 While waiting for my room key I quickly took a mental inventory of the welcoming lounge area, which was furnished with a variety of seating, a collection of pinks, reds, and turquoise. 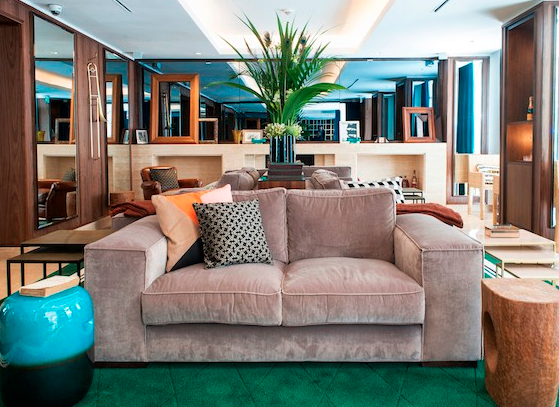 The black-and-white-striped floor was a recently polished marble. I also clocked the modest dining room located behind the front desk where breakfast would be served in the morning. 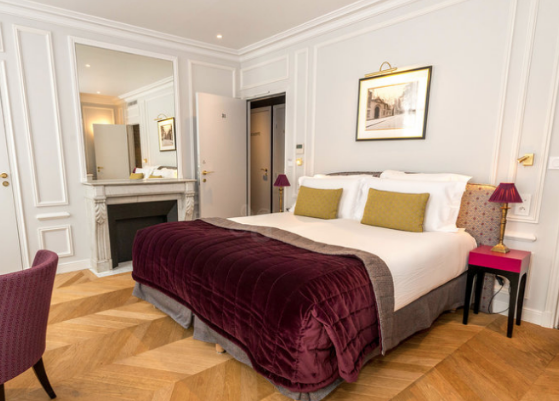 The 31 rooms and suites within the hotel are designed to provide visitors with the comforts and ambiance of a classic Parisian apartment. 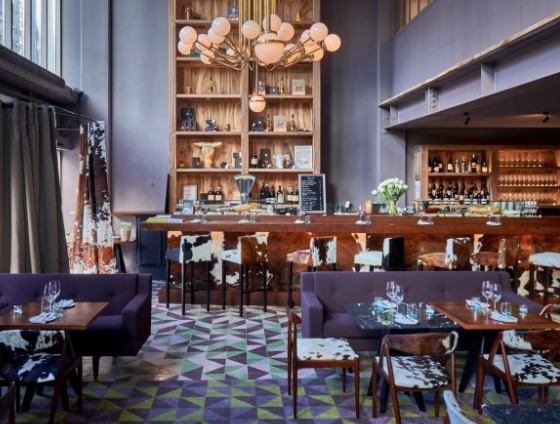 The décor combines classicism and modernity, where the height of the rooms changes from floor to floor (some are called mezzanines) and where classic lines are refined, delicate, and punctuated by gorgeous shades of plum, blue, and gold, all highlighted in a pearl gray. For my first night, I indulged in a complimentary bottle of champagne and a bubble bath to help me settle in. In the morning, I skipped the elevator and took the building’s narrow spiral staircase downstairs where I experienced a continental breakfast that puts its American counterparts to shame. It was more like a gourmet buffet of charcuterie, fresh fruit, and a selection of cereals and traditional pastries (two mini croissants, please). A chef was also available to prepare pancakes or eggs on request. I refrained and explored the rest of the hotel. Down in the vaulted cellar is an intimate spa where guests are invited to unwind in a sauna or book a massage during their stay. Elsewhere, in the conservatory, afternoon tea and wine is served. And if you’re looking to take a walk through the streets of the neighborhood, the hotel’s “ambassadors of traditional French living” will gladly offer guidance or help you in other areas like organizing your airport/train station transfers, booking a restaurant table, setting up private guided tours, or reserving tickets for the theater, exhibitions, opera, and more. Notable spots like Place de la Concorde, the Champs-Elysées, and the Grand Palais are easily within walking distance. 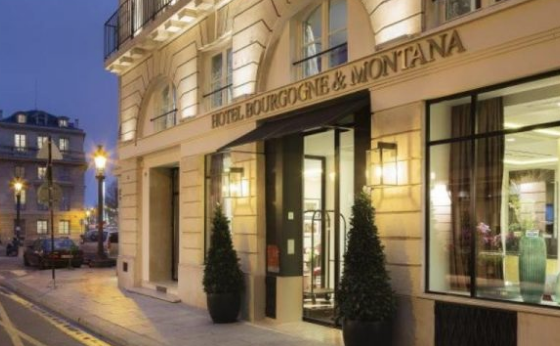 However, a mere block away from the hotel is the start of the famed boulevard Saint-Germain, which curves along the Left Bank of the River Seine. I found myself choosing this route, walking for what seemed like hours, getting lost in the sights and architecture, discovering a sale at C&A and purchasing several shirts, passing through the plaza at the Louvre, and trekking all the way to the fashionable neighborhood of Le Marais, where I feasted on the best savory crepe I have ever tasted at Breizh Cafe (a folded buckwheat square of egg, bacon, cheese, and mushroom). Naturally, considering all of the miles I covered on foot, these calories didn’t count. 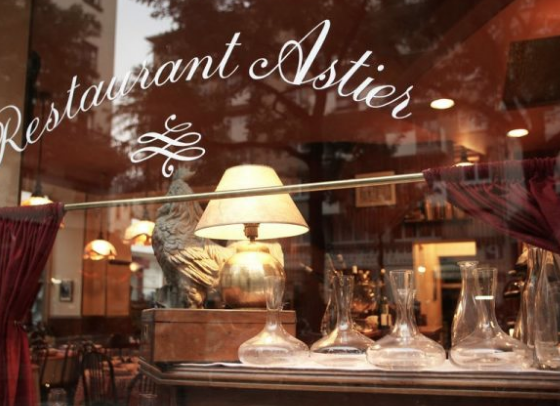 My mission to find the most authentic French cuisine continued when I made a dinner reservation at the quaint Astier, a corner bistro nestled in Place de la Fontaine Timbaud in the 2nd arrondissement. Since 1956, this restaurant has served classic dishes, attracting foodies and critics from around the globe. 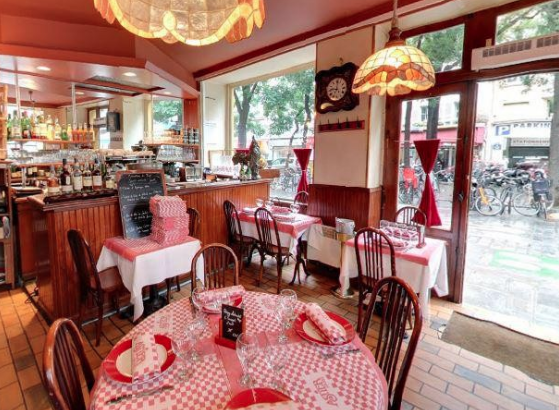 Its modest, warm interior was a welcome contrast to the over-stylized, cosmopolitan eateries that are tritely labeled as “trendy.” Accompanying me was an old L.A. friend of mine, the multilingual Kathleen, who was celebrating ten years of living in Paris. Our friendly server, Sakina, proved to be a skilled sommelier as well, guiding us to a dry and crisp white wine that paired well with our courses. Our meal was a tour of the menu’s best offerings: salmon with Jerusalem artichoke and Bearnaise sauce, marinated trout with roasted fennel, duck foie gras terrine with apple and pear chutney, and roasted breast of duck with cabbage, shiitake, and parsnips. After attempting to finish our exquisite Grand-Marnier soufflé (serves two), we chatted with the Algerian-born Sakina and learned about her background: Before moving to Paris and living on a French passport, she was a history teacher in Qatar and Cambodia. She left her very religious parents at a young age to pursue and curate a life away from her hometown — and eventually fall in love with a local Parisian chef. However, before our dessert arrived, we were presented with the most epic cheese platter I have ever seen. Kathleen offered to guide me through it all, cutting through massive bricks, both hard and soft, and displaying them on my plate in order of sharpness. 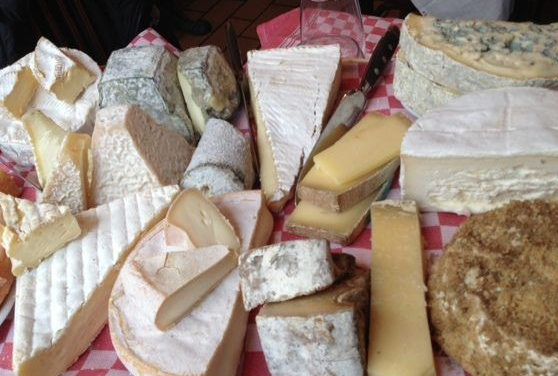 Standouts included the Salers, Brie de Meaux, one fine Camembert, and a tangy Basque sheep’s milk cheese. Before the night was over, we also befriended Caroline, a more seasoned server who has been at Astier for the past fifteen years. She explained, via Kathleen’s translation, how fortunate she felt to work in a place that allows her to learn so much and meet so many different types of people from around the world. “It’s the most beautiful school of life,” she said. After an epic day trip to Versailles, I worked up quite an appetite (see my Instagram slideshow below; shout out to Fat Tire Tours for the cardio). Therefore, for our next culinary adventure, Brasserie Thoumieux, run by two-star Michelin Chef Sylvestre Wahid, hosted us. Located on Rue Saint-Dominique, this Left Bank landmark has been a part of the hotel of the same name since 1923. 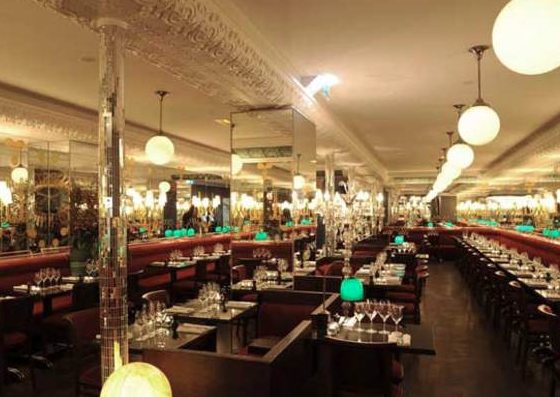 The dining room is its own visual feast with refurbished red banquettes and mirrors on every wall. Charles-Henry, the dashing manager who bore a resemblance to the actor Jamie Dornan (“Fifty Shades of Ooh La La,” I later quipped), welcomed us with glasses of champagne as we settled into our corner booth. 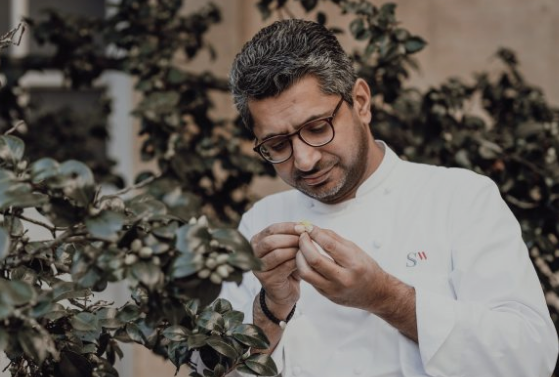 The recently revitalized menu is the product of Chef Wahid, and we savored every bite of our meal, which included Burgundy snails in a garlic butter sauce and the grilled squid with risotto. Dessert was a pair of homemade profiteroles and a matcha green tea-infused strawberry shortcake. By the time dinner ended, we felt the urge to stay out as the night was still young. We thanked Charles-Henry and his crew for their hospitality and stepped outside, ready for an evening stroll. The post-storm night sky was clear, and in the distance, the iconic Eiffel Tower stood in an orange-yellow glow. There was more to explore.